I’ve been working on opensubs.io for a couple of months, and I got all sorts of topics to share about the experience of building and deploying an Elixir application to production. Today I’ll start from the end and talk about the deployment process I used for this project. I like this guide more as documentation for my project, but I hope you can find it useful. A couple of weeks ago I managed to set up the production environment where opensubs.io was going to run. The project is open source on Github if you want to check out. I’ll be using it as a base for this guide. I’ll assume you have some basic knowledge of all the topics we are going to cover but if you feel stuck write a comment this Github issue. I’ll be creating a new branch deployment from 91c25e4 to commit step by step while following guide. The app should be up and running in development mode at this point, but we still need to make some changes to run it in production mode. For this part, I’m taking bits from Phoenix’s documentation on making it ready for Heroku (Even though we will not be running it there) Deploying on Heroku – Phoenix v1.3.0. We will be using an AWS RDS instance, so the only thing we need is to set url config on our Ecto repository configs. This is straightforward configuration. We will freeze DATABASE_URL at compile time, so we need to go to apps/subs/lib/subs/repo.ex and remove the configuration there. Since Elixir is a compiled language, we can have the configuration set at compile time and at runtime. All the configs we are getting from the environment, for instance, SECRET_KEY_BASE needs to be present at compile time when creating the Docker image. Let’s also set session cookie configurations for the sake of completeness. HOST and PORT will be loaded at runtime, and we will configure them on AWS ECS later. When I started opensubs.io I wanted to use Webpack instead of Brunch so I’ve removed everything related with assets that’s why the cache_static_manifest is not present in the configuration for this example. Also, we will not need prod.secrets.exs since all the configurations will be set from ENV variables. We can remove the import. The first step is to compile our application into an Erlang/OTP release and for that process with will be using Distillery. There are a couple of things to be done here. This will make the versioning of releases consistent with the version of the app. Also, we need to fix the release name. For umbrella projects, Distillery uses the project’s folder name to build the release name. opensubs.io is an invalid name for a release name because of the dot. Just replace the dot with an underscore so it does not fail to compile. Now we need to take care of the database. I grabbed the guide that is on the Distillery’s Github to run migrations and adapted it a bit to have not only the migrations run before the app gets started but also to create the database if needed. I’ve decided to place tasks under apps/subs/priv/tasks, so just go ahead and create the folder. IO.puts "Creating the database if needed..."
* Depending on your Docker version, you might need to use @docker.for.mac.host.internal instead of @localhost for the database url so that the container can access the host’s Postgres. Read more about it here. Note on the first step we are defining DATABASE_URL environment variable to be set on the configuration at compile time. Also, note that the database name is subs_prod which means it will be created when starting the application if it does not exist by our pre start hook script. One of the motivations of building OpenSubs was for me to be able to get in touch with technologies that I’m not comfortable with and Docker was on the list. On my first setup, I ended up with a script that was building the release and a simple Dockerfile that was coping the release files inside the release image. It was working, but everything felt clunky after reading Clutivate’s article on Building and configuring a Phoenix app with Umbrella for releasing with Docker. What they suggest is to have both build and release process on the same Dockerfile using Docker multi-stage builds, which I didn’t even know it was possible. You can read more about Docker multi-stage builds here Use multi-stage builds - Docker Documentation. This is great because now we have a portable solution to release our project. The only thing we need to have is Docker available in the build environment. Integrating with Travis CI was painless. To make the secrets available on the environment when building the release, I’m using a mix of ARG and ENV. ARG is used to pass built time variables to be used by Docker on the build phase but since we need them on the environment, we can set an ENV variable pointing to the respective ARG variable. You can read more about it here. Hats of to Cultivate for the timing. Learned some cool stuff! If you are new to AWS at all, I’ll give you a brief explanation of some of the services and tools we will be using. Even though I’m aware it will not be enough for you to understand what’s going on entirely, I hope it will help you with your investigation. AWS ECS stands for AWS Elastic Container Service which we will be using to manage our containers. This goes from pushing the latest Docker image to start and stop the containers. ECS will have at its disposal an EC2 (Elastic Compute Cloud) instance, which is the actual “machine” that will run the application from its Docker agent. 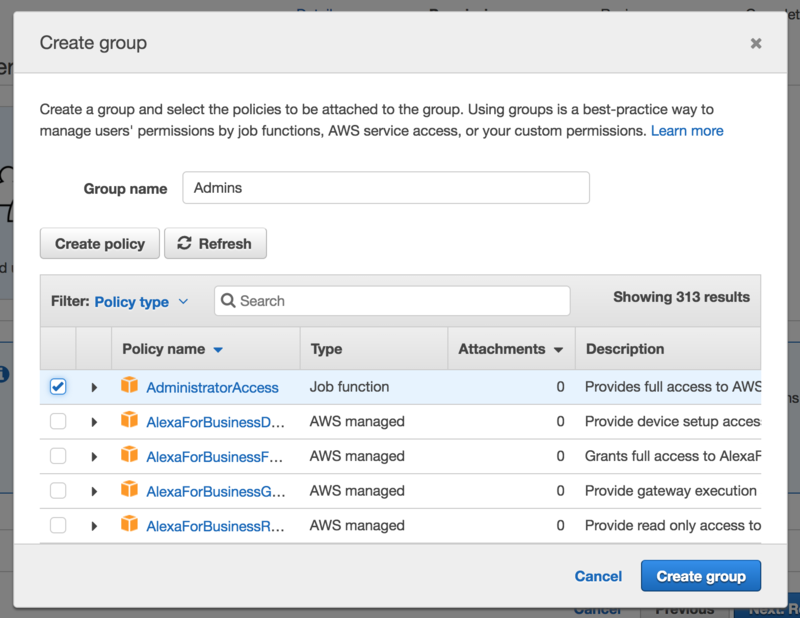 It’s on EC2 where we set the access rules which determines who can access the system where your application is running. These access rules are called Security Groups (SG). For instance, we will add a rule which allows the outside world access our application via port 80, and we will also have a rule that allows us to access the instance via SSH. 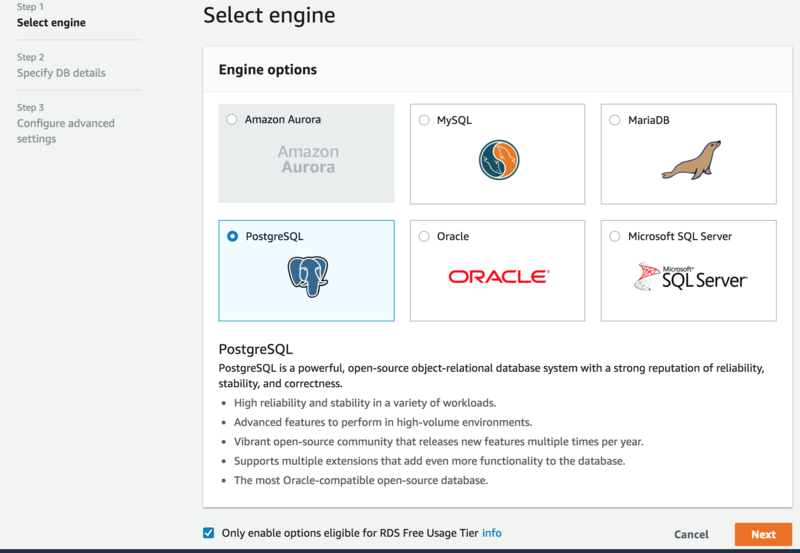 As for the database part, we will use AWS RDS (Relational Database Service) to host our Postgres instance. The initial setup will be done through the AWS console web interface. This will make it easy to get comfortable with all the services we talked about before. However, we will be using the aws-cli to automate the deployment in the end. We will need a user to access ECS API programmatically so we can push the latest Docker image that contains our release. We will also need to start/stop the service that runs the container. Adding the user is straightforward. Open the AWS console, and let’s get started! Make sure to tick Programmatic access, it will generate the AWS_ACCESS_KEY and AWS_SECRET_ACCESS_KEY. Click next to add permissions to this user. We could be a bit more specific here, but for the sake of the example, let’s keep it simple. Here you’ll be presented with the AWS_ACCESS_KEY and AWS_SECRET_ACCESS_KEY. 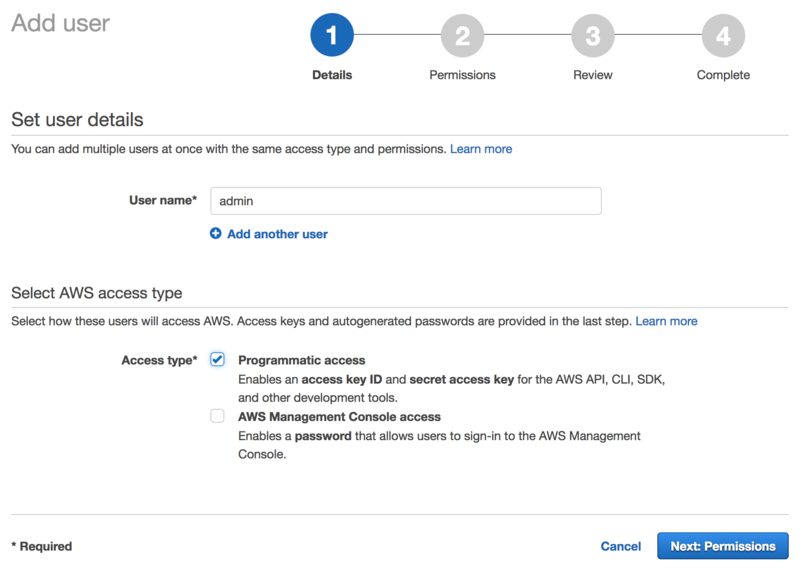 We just gave full permissions to AWS to the admin user, so make sure to store these keys safely. We are done with the user. We will create a cluster called opensubs-production. 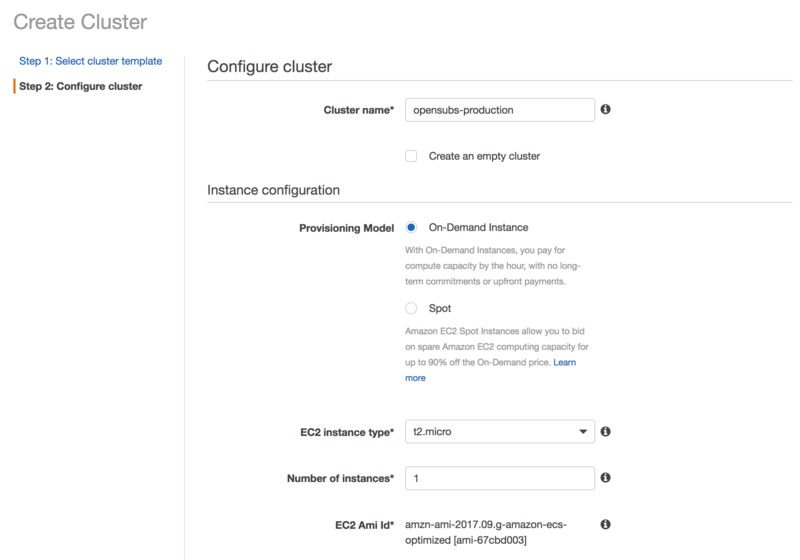 When creating a cluster, a EC2 instance will also be created and attached to the cluster. Later we will change some configurations there. On the EC2 Instance Type, select t2.micro which is available on the free tier. The EC2 AMI ID may be slightly different depending on the region you chose. On key pair, create a new one. After the wizard is completed, the private key (.pem) will be downloaded. Save it in a secure place since it gives you access to the EC2 instance where the Docker container is running. As for Container instance IAM role, it’s essential that ecsInstanceRole is selected otherwise the ECS Cluster is not going to be able to connect with the EC2 instance. 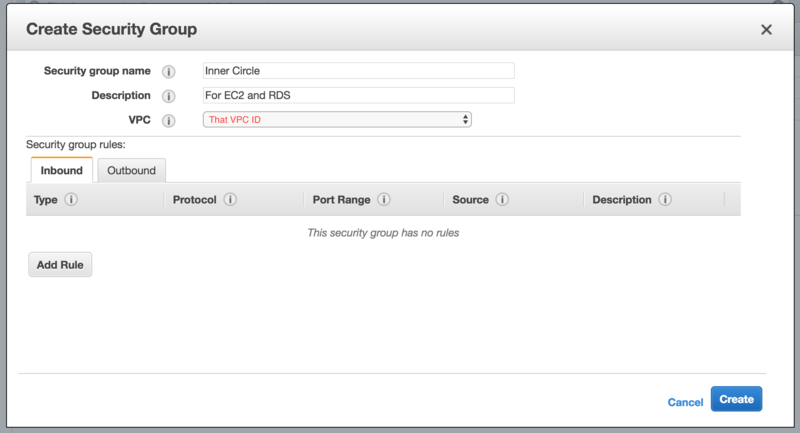 With the creation of the ECS Cluster, a VPC was created with a default Security Group. 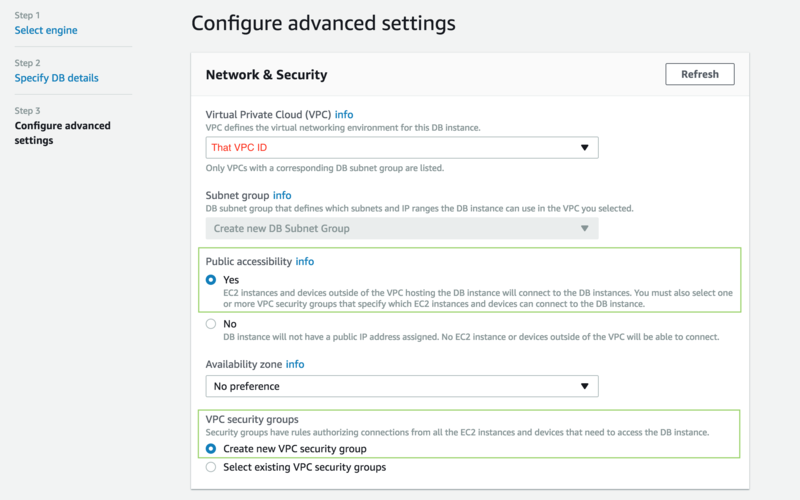 We will not do much with the VPC but we need to make sure that EC2 instance and RDS instance are in the same so have in mind the VPC ID for later. Before taking care of the EC2 instance, let’s quickly create a Repository so we can push our Docker images. ECS will then pull the latest image from of our release from the Repository and run it on the EC2 instance. These commands are hints of what’s going to happen later. We will log in to ECR (Elastic Container Registry), build our Docker image and push it to this Repository. Like I said before, ECS will then grab the latest image from the Repository and start the container. Take note of the url on the green box. It’s the url for the Repository and we will need it for deployment script to populate AWS_ECS_URL (without /subs at the end). This is where we will manage our EC2 instance. Take the opportunity to save the Public DNS (IPv4), we will need it later to access our app and to set HOST environment variable. Next, we will create two new Security Groups. One for SSH access and other to make EC2 and RDS know about each other. There’s already a rule that allows access from the outside world via port 80. We will create our RDS instance in a minute, let’s take this out of our way first. 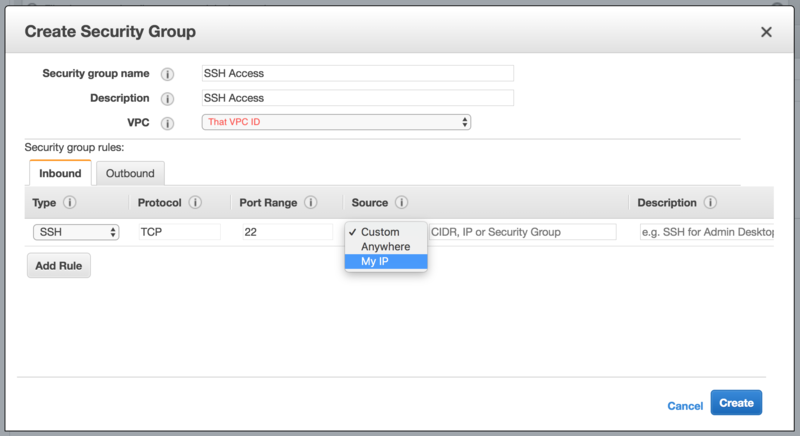 This SG will be responsible for giving SSH access to the EC2 instance from your IP. Save this one and let’s create another SG but this time without Inbound rules. This SG will be responsible for making RDS know about EC2 meaning our application be able to access the Postgres database. Click Create and let’s attach these two SGs to our EC2 instance. Select both SSH Access and Inner Circle and click Assign Security Groups. The setup is almost done! We are finally going to create our RDS instance. Here we are going to select PostgreSQL as our engine. Also, make sure to pick “Only enable options eligible for RDS Free Usage Tier”, this will reduce our options later on. Click Next and set a Master username and a Master password. Make sure to save them so later we can build the DATABASE_URL config. As for the DB Instance Identifier, opensubs-rds is fine. Here we are going to set Public accessibility to true so it can be accessed from outside the VPC. (e.g., our local Postgres client). We are also going to create a new Security Group that we will configure so that the EC2 instance and our local client can access the database. A bit bellow set the Database name to subs_prod which was the one used in the example above. Click Launch DB Instance and then View DB Instance Details. At this point, we have both EC2 and RDS instances up but they cannot communicate with each other. Let’s fix that. rds-launch-wizard was generated from the wizard we followed to create the RDS instance. The first rule allows us to open a connection from our local machine. The second rule (which is actually the Inner Circle SG ID, sg-123456) will open the connection between the EC2 instance and RDS instance. This concludes our AWS setup. It was quite big, but I hope it gave you more insight on what you need to setup to have an application running with Docker. At least this is the kind of guide I hope I had found before falling into this rabbit hole 😄. The last thing we need is to glue everything together with the deployment script. There are two things we need to install to run the deployment script: aws-cli and ecs-cli. The aws-cli will be used to push the latest Docker images to the ECS Repository and the ecs-cli to start and stop our container service. Both tools are required to run the deployment script. The docker-compose.yml is all set with placeholders that will be replaced with the variables defined on the deployment script. This makes things easier to manage. A couple of things to note here, HOST and PORT are going to the environment where the application is running as we configured before. image will point to the latest image we push to the ECS Repository. # If any of this commands fail, stop script. # Set AWS access keys. # AWS_SECRET_ACCESS_KEY from when we created the admin user. # AWS_DEFAULT_REGION is the code for the aws region you chose, e.g., eu-west-2. # Set AWS ECS vars. # These are the build arguments we used before. # Note that the DATABASE_URL needs to be set. # These are the runtime environment variables. # Note that HOST needs to be set. # be pushed to the repository. # Tag the new Docker image as latest on the ECS Repository. # Login to ECS Repository. # Upload the Docker image to the ECS Repository. # Build docker-compose.yml with our configuration. # Deregister old task definition. # Stop current task that is running ou application. # This is what will stop the application. # Start new task which will create fresh new task definition as well. # This is what brings the application up with the new changes and configurations. Finally, accessing the application via EC2 public DNS (that we’ve used on HOST environment variable) should display the default Phoenix Framework page! I’m not expecting everything to go smoothly so if you have questions or something went wrong, go to the Github issue I’ve created to discuss this guide.